CHALLENGE: Let’s face it. No one enjoys buying sympathy cards. There is absolutely nothing fun about having to go to the store to buy a card for the loss of a loved one. That is why I only make handmade sympathy cards if someone specifically asks for one. It is so depressing to try to come up with designs when you know that grief is involved. SOLUTION: I came up with an elegant design that is gender-neutral and classic. You can use this template to help you when you need to create a sympathy card. Honestly, it was kind of therapeutic to make. It is a great template because you can put to use several of your Stampin’ Up! products, both current and retired. WHAT IF THE ITEMS SHOWN IN THE EXAMPLE ARE RETIRED? If you don’t have the retired Tulip Textured Impressions Embossing Folder, any Stampin’ Up! Embossing Folder will do. The ribbon is retired, too, but we have several ribbons from which to choose. I colored the flowers with Blendabilities, which are currently discontinued. You can easily use any of Stampin’ Up!’s other products that are designed for coloring. Just keep it simple and understated and you will do fine! 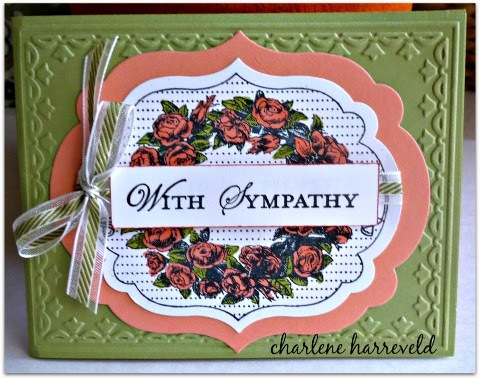 Share links to your sympathy card creations in the comments section below.